Can I switch back to Windows XP from Windows 7? It's very possible to remove Windows 7 and switch back to Windows XP. I'll describe how. In my opinion, however, switching back to Windows XP is a mistake. At present, I'm running Windows 7 and find it really complicated. Is it possible to change back to Windows XP Home Edition which is easier to use? It's a bit of work and I'll review what it means to do that. I'll also share with you my thoughts on why I believe doing so would be a mistake. Reverting any machine capable of running Windows XP back to it - known as "downgrading" - is actually very simple: get a copy and install it. And, if your machine is capable of running Windows 7, then it's probably quite capable of running Windows XP. "If you're going to expend effort, I strongly recommend that you spend that effort getting used to Windows 7." Get a copy of XP: You might have a copy lying around that you're not using anymore. OEM discs don't count, as they'll typically only work on a specific manufacturer's machine and they're often legally restricted to only those machines. If you don't have a Windows XP install disc that you can use legally, you'll have to purchase one. You might find Windows XP on the secondary market, some retail stores, auction sites or more. For the record, you're not "entitled" to a copy of Windows XP if you don't like Windows 7; you'll have to purchase or acquire a separate, legal copy of Windows XP. Back up: Installing Windows XP from scratch will typically erase everything on your computer. The only thing that you can do is back up everything first. Make sure that you do this to avoid losing valuable data. Reformat/Install: Install Windows XP by using the reformat operation to clean off the hard disk as part of the installation. How do I reformat and reinstall Windows? has the process. Reinstall applications: Reinstall all of the applications that you had that were separate from Windows. You'll need their original installation media and/or downloads. 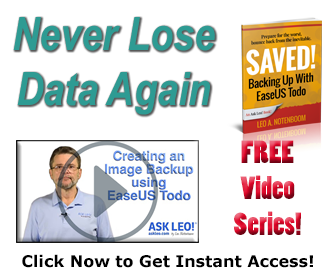 Restore data: Copy all of the data that you'd been keeping on your computer prior to this operation from your backup or any other convenient storage place that you used. That's it. You're running Windows XP. Welcome to 2001. I believe that reverting to Windows XP at this point in time is a mistake. Your support options will only become fewer. 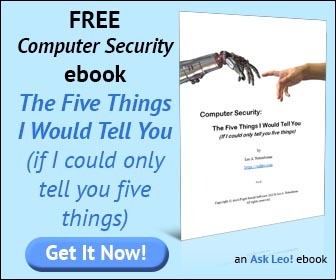 Technical support sites and services, like Ask Leo!, will slowly begin to stop servicing Windows XP. You can see it right now as getting support for even older operating systems, such as Window 2000 or Windows Me, is extremely difficult. Microsoft itself is already phasing out support for Windows XP; at some point, that will include not fixing security vulnerabilities. Software is already leaving Windows XP behind. A current example is that Internet Explorer 9 doesn't support Windows XP. You may not care about IE9 today, but something or other will come along soon and you may very well care about having it. Hardware will soon leave Windows XP behind. My only hesitation in writing the sentence "...if your machine is capable of running Windows 7, then it's ... capable of running Windows XP..." is that it will not be the case very soon. Device manufacturers will stop supporting older hardware; newer hardware and add-ons will stop supporting Windows XP. The writing is on the wall - Windows XP's days are numbered. I believe that it's a mistake to intentionally revert to a dying horse however beloved it might be. "But what about people who are using Windows XP today?" I hear you asking. Its days are still numbered. Folks with older machines who continue to use Windows XP often have very valid reasons for staying there. Typically, the hardware that they have won't support Windows 7 or the upgrade is simply too costly. They're still going to have to upgrade someday, probably when the time comes to get a new machine. You, on the other hand, already have Windows 7 and a machine that's very capable of running it. The fact is that reverting to Windows XP is going to be a fair amount of work that is not without its own set of frustrations. You can "outsource" some of the work by having someone else do the reinstallation, but there will always be issues and things missing. If you're going to expend effort, I strongly recommend that you spend that effort getting used to Windows 7. What I hear from people is that, while their initial reactions are often negative, they end up liking Windows 7 - often better than Windows XP - after living with it for a significant period of time. I know that you won't feel that way right now. And, of course, it's possible that you're one of the people who will hate it forever. But from what I hear, that's actually unlikely. And in either case, I'm fairly certain that Windows 7 (or perhaps its successor) is in your future someday. If you've got it, I really recommend you stick with it. How do I reformat and reinstall Windows? Sometimes the best approach to resolving an issue, be it a virus or simply software rot, is reformat and reinstall. We'll review the steps. Can I switch from Windows Vista back to XP? Windows Vista comes preinstalled on most new computers these days. You can typically revert to Windows XP if you like, but not without a little pain. Can I revert from Windows XP and NTFS to Windows 98? Reverting to Windows 98 from Windows XP and NTFS can be done, but it's a lot of work and not recommended. I am interested in XP because some of the software I know and love simply doesn't work under 7 / Vista. @Bob Are you using Windows 7 Professional, Ultimate or Enterprise? XP mode doesn't work on any of the home versions. Don't forget the device drivers. You'll most likely have to source drivers for your sound, video, network, and a whole bunch of peripheral devices you may not even consider until they stop working. If you've got a brand name machine, such as HP or similar, it's well worth visiting their web site and downloading all the neccessary drivers before blowing away your hard drive. If you've got a custom build, you'll need to go to the web site of the motherboard manufacturer and download drivers from there. You don't want to find yourself needing to get on-line to finish some aspect of the rebuild, only to find your network connection won't work. A full rebuild of this nature will take considerable time. You will need to be prepared for a certain amount of frustration if you want to take this project on. We waited a year to upgrade to Windows 7 from Windows XP, largely because Windows 7 does not allow a pan and scan virtual desktop to be set up (they changed the default graphics subsystem beginning with VISTA). I set up the computers with a dual boot with Windows XP as a safety valve. But after a day or two of using Windows 7, none of us have looked back and we've eliminated the Windows XP partitions. And the low cost utlity Gimme Space Desktop Extender has proven to be an adequate substitute for the pan and scan virtual desktop. I must say that Windows 7 is easier to use than Windows XP, especially for those who are not terribly computer literate. I'm at a loss to imagine in what ways the initial inquirer finds Windows 7 to be more complicated to use than XP. It would really help if that person could give some examples of what is more difficult in Windows 7 -- my guess is that the folks here could tell him or her how to do what he's trying to do without great complications. I know Leo's focus is on Windows solutions, and I applaud that. But rather than go backwards to XP which is terminal, perhaps consider Linux, be it Ubuntu or other versions. The evolution is frequent, (6 months in some cases) but more gradual. It's free, easy updates, and current. The beauty is that you can 'try' it without committing, to verify you like it. I see it as becoming more plausible, given the turmoil with Microsoft's stream of 'new operating systems' and Fees. Additionally, remember to consider the 32/64 bit question when going backwards, as newer Windows 7 machines tend to be 64 bit machines. You'll need a 64 bit XP version if that is your machine. I'm a die-hard XP user. I'm used to it, got it working the way I want and I like it. But I can read what's spray painted on the wall. I plan on getting the W7 version I can learn to love but I will do a dual-boot with XP. My scanner, printer and others gadgets might be old but they still shine just fine on XP. It comes down to - "Give me your money, please." The vendors want to sell the new stuff so they don't worry about upgrading drivers for the old stuff. I can't see reverting to DOS 6.2 with Win 3.1 but there are things I still like about those days. Without intending to belittle the person who asked the original question, I can't understand why someone would want to go back. We bought a computer for my father-in-law years ago (in the XP era) when he became a widower, and he was hooked immediately. We have bought 2 replacements since then, including a Windows 7 laptap last Christmas. Each new computer has required that he re-learn how to do his favorite activities. I know he's got some experience now, but he says Windows 7 is the easiest of all of the systems to use. If an 83-year-old (who doesn't like much these days) makes that claim, then I've got to believe there's something to it. Microsoft has included some excellent tutorials with Windows 7 that teach the user how to perform various tasks. And there are always the "Idiot Guides" that are of varying quality. But there's no reason to dislike Win 7. FWIW, that link is to a PDF from Microsoft: "Microsoft Security Intellegence Report". I haven't read it yet, but wanted people to know what it was before they click. I'm have tremendous sympathy for the person wanting to abandon Windows 7 for XP ... or for ANY previous version of Windows s/he's more familiar with. I have nothing against Win 7 ... I use it myself. But I DESPISE Microsoft's habit of dramatically revising the OS interface and the location for its many controls, apparently wanting us to be impressed. Yes, there are ways to adjust the theme and other aspects of the interface, but even finding all these controls and making the necessary adjustments are a challenge, thus they're also a major, major annoyance. By making so many changes to their interface, while some users may feel "entertained"/impressed by the changes, others wanting to concentrate on productivity are extremely annoyed. Because of this, I'm also researching a switch to Ubuntu, or possibly Solaris, an OS I was once familiar with. An analogy ... If Microsoft was in the home improvement business and I hired them to upgrade my kitchen appliances and bathroom fixtures, they'd say it's also necessary to reposition all the furniture in my living, dining, and bed rooms. While some interface changes may be unavoidable, users would be better served if the adjustments were evolutionary, not revolutionary. And if I could directly address the people responsible for these interface design changes, my question would be, "Why do you feel it's necessary to make such drastic interface changes which have the effect of making experienced users instantly become novices?" The answer to your last question would be "because our research shows that the new interface is more effective, more intuitive, and people are more productive using it". Seriously, they don't change anything to impress anyone - they make changes based on research to improve user experience. Look at the other comments and you'll see many people have the opinion that they got it right. Of course they can't please everyone, you, I and they know that. Some will not appreciate the new UI. But they most certainly don't do it on a whim. I was shocked when I saw that the latest version of Ubuntu Linux went through a similarly massive UI overhaul. It's not just Microsoft, and it's not just Windows. Things change. You'll see that all editions of Win7 are listed. As a computer tech that is mobile, the hands-down best OS is XP. When I visit a client house or business, XP is on my laptop. All my computers have multiple drives with XP, Vista, Linux, and Win 7, so I can use whatever I want. Solving networking issues, etc. demands XP. Nothing else is even close. My advice, ....stay with XP for as long as you can. It will do everything you want; period. I loved win7 the first time I ever booted it up! I thought I would NEVER get over losing win98, then the same with XP. I'm finally learning that change is sometimes good! I played with Win7 RC and was sold....I bought it on preorder along with 5 other copies because I believe in Win7, it IS easy to learn. Those that want to switch back, it seems, dont like change. Leo is right, think back to Win98, no antivirus will run on it now...NONE. Computers cannot be compared to other things such as home, cars, ect...try going to Ford and asking for a replacement part for your Model T, I'm not to sure you can, but if you could, think of how much $$ it would be. Everything gets a "facelift" and why not? There are soooo many things Win7 can do that XP can't, Win7 can do things that XP can do and MORE. My sis had an XP machine and it was constantly crashing because of something she did wrong, easy fix for me, but for her it was very time consuming (it was for her and her husbands business). I got Win7 and told her she needed to get it to, she went and bought a new machine about a year ago and she has not any trouble with it, but I'm always helping them with their Xp machine...still. She loves the way they have Win7 setup and she says its so easy. My thought, learn Win7, it isnt really starting from "scratch", just a lil bit different. Truthfully I was an XP holdout. I avoided Vista like the plague. I "got" XP and could make it do what I needed it to. I even got to point and laugh at Vista. That was then. This is now. When time came for a new PC I relented and got Windows 7 Ultimate 64 bit. It was to be installed on my new high end PC. While it was being built I ordered Windows 7: The Missing manual by David Pogue (O'Reilly Books- cheap at Amazon). I read the basics before the PC got here and once it was here the book and I played around with the new operating system. The book starts with very basic elements of Windows 7, as basic as almost anything in the For Dummies series, and builds up through about anything everyone from the casual to serious user would ever need to know. Everything is written and described in simple, easy to understand English with loads of screen shots and charts giving more depth to the information. It's 860+ pages! Finding specific topics is easy, too, thanks to a superb index. You don't need to read the whole book, but if you are new to 7 you should read the first several chapters which will clear up most problems people seem to have adapting from XP. You also don't need to read the book in order unless you want. Most users will just go to the section they need to look at at things come up they are having difficulty with..
For more technical type reference I bought Windows 7 Inside Out by Ed Bott, Carl Siechert, and Craig Stinson from Microsoft Press. It also came from Amazon and was priced very reasonably. Typical users can probably pass on that one but The Missing Manual, as it says on the cover, should have been included with every Windows 7 PC and a coupon inside every copy of every version of the Windows 7 operating system disc. I cannot recommend that book enough whether you are new to Windows 7 or have been at it awhile! Within a few days of using the book and exploring my PC I became a believer in Windows 7 and I would never go back to XP. Ever. My favorite thing is when I turn my computer on within 50 seconds it's up and ready to go with everything loaded. It does so much more than XP did and everything it does that XP did, Windows 7 does better. It's cleaner, faster, safer, and just works better. Again- XP was my favorite Windows OS! I was so thankful I was smart (or lucky) enough to buy a good reference to guide me rather than just wade into it thinking my XP background was going to help me. I would bet with certainty the problems you are having is because you are using Windows 7 like you remember using XP. No wonder it's confusing! Very little is the same! It's cliche but taking XP usage into Windows 7 is like trying to establish a relationship with someone new and behaving like the new person is a clone of the old person with all the same likes/dislikes, interests, mannerisms, and wardrobe choices. Unless you accept the new one for what and who he/she is and take the time to learn about and understand him/her it will be a most strenuous relationship likely to fail!! I have to admit even with my manual I still struggled a few times with Windows 7 because I would get to things I assumed I knew how to do and got an unexpected result or no result at all. I finally admitted that just because I knew what to do in XP this was nothing like XP. Once I finally fully embraced that concept I had no further difficulty with W7 and after doing things a few times it became second nature. Again, I have decided Windows 7 was/is brilliant! Now, I still have XP Pro on my laptop and two desk tops, plus Vista on another desk top. I will end up upgrading the Vista machine to Windows 7 but the XP machines will stay XP until I find reason to change. They aren't my main PCs and each has a more or less dedicated purpose so the cost of upgrading isn't justifiable right now. Plus, I would have to do a clean install of about everything which is tedious even with Easy Transfer to assist with moving files. Windows 8 is slated for 2012 which will put XP either 2 or 3 generations behind depending on if you count Vista. So, to conclude, for anybody struggling with Windows 7 I recommend getting the Missing Manual book I mentioned above. It's cheap and easy to understand. Get it, read it, and do things on your computer as you go along. Don't try to bring ANYTHING you know about XP or used to do with XP to the table. Learn to use that "search for programs and files" box at the bottom of the W7 Start Menu and you will come to wonder how you ever got by without it. The learning curve with Windows 7 is not that long or that steep. Give it a chance and use some guidance rather than by the seat of your pants (or skirt) and I promise you sticking with it will make you glad you didn't go back to XP. I thought XP was great. Then I used Win 7. Unless there were mitigating circumstances (cost of upgrading, old hardware, incompatible or proprietary software), why would someone would stick with a decade old OS? Win 7 is rock solid, far more secure, available in a useable 64 bit version, has many more features, and (I think) easier to use. The time will soon be come when keeping an XP system going will no longer be worth the effort, as there will be no support from MS or manufacturers. Sure, tried and true is fine...unless what's new is obviously better. And Win 7 is volumes better over XP. patience. I am currently running 7, Vista and XP. Finally, Windows 7 is curved ball, and certainly not a round type. You have forgotten the one thing that is actually difficult about the whole thing. They are not always available. Especially for laptops. I demand simplicity. Little baggage or fluff. Windows 7 and newer versions of MS Office don’t offer that. Most comments here are by geeks. Like go read an 860 page book! Sorry, me and grandma don't have the time, energy, or desire for that. So when XP goes belly up, I'll install Ubuntu. I now occasionally boot to Ubuntu from a thumb drive. It’s sweet. Sayonara Bill Gates. Actually many of the comments here are by average users. I'll also point out that Ubuntu is not immune from change. I was very surprised to find that the latest (11.04) includes a massively different UI. Why is that OK on Ubuntu and not Windows? 7 is fine, but XP still has far more available third party software. In addition, 7 doesn't have a repair connection for the internet like XP, and quite a few other functions that I like. 7 is just more automated, going the way of mac, not a bad thing, just different. I don't understand the "doesn't have a repair connection" function - I find Windows 7's network troubleshooter miles ahead of XP's old repair. It fixed problems that I couldn't figure out, and as a test correctly diagnosed several that I could. Recently, I installed XP Pro (32-bit) on a five year old HP Compaq laptop for a friend, replacing Vista. The first issue encountered was that the XP installation disc (institutional license, SP 2) had only PATA drivers and the disc was not recognized. Disabling the native-SATA setting in the BIOS resolved that issue. After the installation was complete, the next challenge was to find drivers for the machine compatible with XP. Numerous on-line searches turned-up several possibilities (none from HP, who seem to frown on downgrading), most of which either did not completely install, or caused overheating severe enough to trip the thermal safety and shut-down the machine. Though drivers were finally found that appear to be working properly, there is no way for me to know whether they are correct (or even optimal), but the machine has been running reliably (full functionality and no BSOD issues) for a few months, and though warm, without overheating. Questions: how can one determine whether the installed drivers are optimal, and would there be an advantage to using the HDD in SATA mode (if so, does one simply install the appropriate driver and reset the BIOS)? I think you forgot one more time- and nerve consuming task: reapplying Service Packs and Microsofts' updates. Depending on the age of your install media, this can be very painful, especially if your network connection is not a (very) fast one. AJNorth, HP has a wonderful support forum run by volunteers that has great resources for downgrading--and upgrading Win flavors (especially for HP/Compaq owners). Go to: http://h30434.www3.hp.com/ and do a search for downgrading to XP---and good luck! I just bought a new Dell note book computer with Windows 7 installed and wish my old HP with Windows XP had not gotten sick, or I had gotten it fixed. Windows XP was clean, simple and easy to navigate. Windows 7 tries to be too helpful, or fancy. And only ends up making everything a mess. I am grateful to Leo and to everyone who has posted considerate and thoughtful comments on this page. I have been dreading "upgrading" as from my experiences of Vista, 7 and Office 2007 and 2010 I dislike the interface, the graphics, the nags and indeed all the "improvements"; at least what I have read here gives me some reassurance that I will learn to adapt to them. I simply don't understand why the graphics have been made less sharp, contrasty and readable, or why traditional menus seem to be on the way out. To use Office after 2003 we have to keep consulting help to discover which of the arcane army of icons displayed actually conveys the required demand; it's very slow at first. Also, the working area is reduced: I noticed that in Outlook it has become such a small strip that photos in emails have to be viewed in stages. Give me good old Outlook Express every time (sorry, Leo!). If I had been starting with Office now, deprived of the easy leads given by traditional menus, I think I might well have quickly given up the struggle of learning it. Keep Windows 7 and install Virtual Box then install Windows XP as a virtual machine, its quick simple and full function. I also am very frustrated with Win 7 and would like to go back to XP. Is Microsoft forgetting who the customer is. Yes the poor masses out here who are not computer wizz kids, we just need a simple tool to do a job and if Bill and his friends cannot supply it, the masses may have to go to someone who can - ANY SUGGESTIONS? Why do they have to reinvent the wheel each time (Vista - not a very good wheel). Just improve the wheel you have and for me that should be XP. I am of the opinion that Leo makes perfect sense. Each time a new version of an OS is launched, there's much that undergoes a complete change. however, just because you or I are used to being with an older OS, doesn't mean we would spend our life with an old horse. besides, all the new OSes, no matter designed by whichever company, target only one thing, 'aiming towards a better technology'. Windows XP in its days, was one of the best but it has far outlived its life & needs to be banished. option is to install XP in a different partition than 7 or on a different drive? WIN 7 on the same machine. run my old programs that the straight installation of XP cooks through. Thank you for your article on downgrading to XP. I still use all XP PCs myself, but I also have to sort out Windows 7 PCs used by others. I now understand the frustration of XP fans, but maybe it's just that like me they do not know an easy way to get around the problems they are experiencing. If they reveal precisely what the perceived problems are, then maybe you can help to resolve them. 1. In Windows 7 Explorer I cannot always successfully browse the network, and see all of the servers available. Sometimes it works, but usually it does not. I am normally logged on as domain administrator, so I expect full and easy access, which I get in XP. Is there any way of correcting this behaviour? 2. In Windows 7 Explorer when I am browsing a network drive the folder tree in the left hand pane keeps collapsing as I move around folders. This is really annoying as I cannot "see" where I am in the folder structure. Is there any way of stopping this? 3. In Windows 7 when I delete a user, it is NOT deleted. It remains in the registry, and before I can create a new user with the same name I have to edit the registry by searching for the old user's entries and deleting them manually. This is not necessary in XP, which does properly delete the user from the registry via the control panel. Is Microsoft moving away from GUI and towards text editing as a routine event? This seems to be the case with Exchange 2010 too. It would be really useful to create a list of these specific Windows 7 annoyances to see how many can be removed by configuration changes. Alternatively, you could tell us which, if any, of these annoyances will be corrected in Windows 8, due out next year, so we can see if it is worth waiting for. #1 I don't have an answer for. #3 To be honest, it's simply not a good idea to be creating user names that are the same as previous (and deleted) user names. Windows can't change some of the things that it assigns when you create a user once, and as such I've always found that creating the same username twice to be a path down which there are assorted issues. While they've done a poor job in how they've handled it, I'm not surprised that this is perhaps more difficult in 7, if only to discourage the practice. I bought a new laptop with win7 pro. I liked it till I loaded or tried to load all my programs on it. Only 1/2 worked. Office 2000 Premium, everything worked except Outlook. Being I use outlook express for work email rather than gmail on web. My preference. None of my CAD programs worked on Win7 Pro, I also tried several versions of running in XP Mode, all failed. I spent 3 hours designing on Win7 XP Mode on 1 CAD program and I was unable to save it anywhich way I tried. Win7 gave me an illegal instruction no matter where or how I tried to save it. So, bought a new HDD, loaded XP on it, reloaded all XP drivers for new Laptiop and I am back to being very productive. Win7 Pro HDD is safe and sound for the future when MS wakes up and makes XP Programs operate nice together. Bill Gates once said, if you find an OS that works for you, and you paid for it, use it forever. (Not his exact words, I forget his exact wording, The interpretation is what I went by). So yes, you can get back to XP and not very difficult at all. I still have the original Win7 HDD to play with and can swap out and boot from ext HDD case. Just installed Win7-64 on a Sandy Bridge, have WinXP-Pro on my i7 950. There are still bugs in Win7 requiring registry hacking. The virtual XP is not completely compatible either. For the few programs needing upgraded OS, I would run the many that are reliable with XP. The object is, just get the job done. My old and only PC from 2001 with Windows XP died. I bought a new Dell PC with a fast 3.2 dual-core processor, 32-bit. I disliked Windows 7 so much that I took it back and had Windows XP installed on it. I will never regret that decision. Thank goodness I bought it from a local computer shop. Now all my beloved programs run super fast on it. Microsoft will support XP until 2014, and as I am old, I will probably have XP for the rest of my life. 66% of the world's computers run on Windows XP. When I had my recent surgery, I looked up on the computer monitor and saw Windows XP. If it ain't broke, don't fix it. You haven't been very honest with your readers. You make it sound as tho using Win 7 is a peace of cake, but my experience has shown me that you are at the mercy of MS when a new OS comes out. A good example is Vista. I personally consider my time worth something. I should be getting at least $70/hr. for doing their QC work. Instead they want the users to do it for free. I'm sorry your advice is false because Win 7 brings other problems along with it, guaranteed. And this will cause me to take time away from my work to figure out what went wrong with the installation of Win 7 or why this program or that program won't work, or what's even worse, system crashes. No thanks! Why not add Windows XP and have a dual boot system. Then you could use either OS. Of course you will have to find out how to do this but there are many articles on the Internet showing how. I see this kind of thing EVERYDAY! And I do sympathize... up to a point. I own a small computer store that deals with new and pre-loved PC's. We see all manner of PC's and computers users. I firmly believe that there is nothing wrong with wanting what is comfortable and familiar as long as it works. Different people have different learning and communication styles, and some respond to change quite negatively. It's neither good nor bad... it just IS. Change is not evil (par se)... but it is inevitable. Learn to deal with it in a way that works for you. I use Vista, XP, and Windows 7 (and Android) and like/dislike things about all of them. I tend to think of an OS these days like a car. As long as it gets me where I want to go, I'm not too fussed about what's under the Hood. When we get a batch of ex-lease computers in to refurbish, I usually get stuck with the task of reinstalling the operating systems, and of course finding the drivers and putting on the 'goodies'. I dread the computers that have XP license keys because I know I'm in for more work than if the same PC had Vista or Windows 7 on it. I love XP. It is like a comfortable pair of jeans I'm loathe to retire – but those jeans are getting a bit tatty and worn and will eventually be relegated to the recycle bin. Sadly, it is getting increasingly harder to find drivers for some XP computers. Some days when I have spent hours looking for that one elusive driver, I simply throw in the towel and grab a Vista or Windows & License and 'wear' the extra cost involved. (My sanity is worth more than the time and frustration involved to stick with maintaining XP.) When installing Vista and Windows 7 it is (usually) just a matter of running the Windows updates and the missing drivers are installed with the optional updates. I rarely have to hunt them down. I DO get customers whinging about wanting XP on their brand new PC (all the time), and I still occasionally downgrade a new desktop PC... but it is getting increasingly difficult to retrograde some notebooks, because the drivers are not readily available. For the really Vista or Win7 phobic customer, I often throw in a free 1 hour one-on-one tailored lesson to help them find their way around the new system. This usually clinches the sale and eases the customer into the unfamiliar. Problem solved. Well I just finished reading all the negative comments about Win 7. I was sold on Win XP for a long time, and loved it for a long time. I swore I would never buy Win Vista nor Win 7 when they were released for sale. Got Vista one day....did not care for it to much....kept going back to XP. Then six months ago I purchased Win 7 Home Premium....to give it a try. It look liked a simplified version of Vista....so I felt, at the time. As days went by while I was devouring this Win 7 to learn what makes it work, I realized that a 320 GB hard drive would be just fine for me....well, I got two of them.... I installed the second HD in the same computer, to be used as a backup space for all the things I need to save. I already had a GeForce 6200 AGP Graphics Card installed in this computer, needed for my Microsoft Flight Simulator X Deluxe Edition.I must say....all my previous programs that I had on XP, works just fine on Win 7,and as a matter of fact....even better....Win 7 makes sures of that....if a program needs to be updated, Win 7 updates it, or takes you to the correct web link site so you could update it yourself. Win 7 has a lots of goodies that XP did not have. By the way, I run this win 7 on a old computer, it's a hp Compaq d530C Pentium 4, P2.66. Every six months I take this computer apart for cleaning....all the cooling fans, even the cooling fan in the the power unit !, the processor heat sink plate, new heat sink conductive paste for the processor, and so on. Anyhow.... now I am sold on Win 7. To you all who do not like Win 7 or did not take the time to learn all the possibillities Win 7 offers, I respectfully say to you....Goodby Win XP....HELLO WIN 7. !!!!! Doesn't Bill Gates have enough billions of bucks already? It's like each new operating system eventually forces you to upgrade, whether you like it or not. I like XP and am comfortable with it. I would like to keep it but will be forced to 'upgrade' with a system that will have bugs and take MY time to learn. To me it all seems like a racket... force them to spend more and more money on our software. And now I'm plagued continually with the notification crap that my copy of XP is invalid. I have tried everything and can't get rid of the crap. I had my hard drive fail a few years ago and the small biz that worked on it used the bench copy of XP, so the ID number had been used many times before. I own THREE copies of XP but it won't accept any of the ID numbers. Instead I get those annoying messages, it turns my wallpaper to black every time I reboot and plagues me over and over with little pop up messages. If you have a legitimate license number that XP won't accept you can phone Microsoft and they will ask you a few questions and give you a new serial which should in almost all cases work. You might have to jump through a few hoops to get their number or someone might post it here after seeing this. XP and OE6 are a fine fit ... oe doesn't TELL me I must use its "contact manager" or it won't remember the email addresses - unless I transfer all my contacts ... I have a great contact manager DB - I do NOT want Microsoft DICTATING to me what products THEY will allow me to use and how I will use them. I am frustrated enough with Word auto formatting, finishing and fighting to do WHAT I WANT to do. Keep It Simple Stupid ... Outlook IS NOT like OE6 and when I can do exactly what I want with my files - that is technology controlling me vs ME using technology to make my life and business effective. Not a total revamp to satisfy some megalomaniac that seems to think it's cool to completely change everything on a new programme RATHER THAN FIX & IMPROVE what wasn't working. I have searched for 2 days trying to find some way to find O6 for Windows 7 64 bit ... yet nothing works. YET CE industry TELLS ME I must have 500 g or 750 g hd ... but I CAN'T have my OE6 .... with No Comparable Email .... Thunderbird has so many complaints that I decided to keep searching for an OE 6 fix. I'm paying for it, give me what I want. There are a couple of options for running OE 6 on a Windows 7 machine. If you have Windows 7 Professional or above, you can download XP mode for the virtual machine and it comes with OE6 preinstalled. If you have Win 7 Home Premium and an XP license from a discarded computer, you can get Virtualbox http://www.virtualbox.org/ and install that version of XP into it. It also has a built version of OE6. I dont upgrade my pc to anything. I run windows xp and couldnt be happier. I use pretty wide array of software too. and to this day only one program I couldnt install on my machine was corel draw x5. thats about it. this whole windows 7 deal is about fashion only. I fix computers and I hear a lot of times in peoples voices how they want to have windows7 because its the latest shiny thing. they don't have a clue what it is or why is it different from xp. they just want to have it because its part of the trend mainly. and all this lack of support thing is bull. if you're capable of using google, there is support for anything online. When lack of support is mentioned in the case of XP, it usually refers to the time when MS will stop producing security updates for XP, and not so much about user assistance. This will be a couple of years away, and for those using XP without any problems, I certainly agree with you, "If it ain't broke, don't fix it." I think it is disingenuous at best to recommend that users spend their hard earned $$$ just to appease MS. They have been ripping us off for years with very little consequence, other than slightly losing a little market share to Apple. I personally resent any implication that it's best to "go with the program" just to accomodate the arrogance, stupidity & greed of a monopolistic organization that Bill Gates & attack dog Steve Balmer have profited from obscenely. The best solution is to work around any & all changes that will cost you even more time & money, so that you can remain productive for as long as possible with minimal expense. I have had a long history with computers, my first attempt of modifying a computer, was the PCjr. I have tried just about every operating system for the PC. And I can honestly say Windows 7 is the worst bloatware I have ever seen. that rely on Opengl. Yes I know M$ is pushing Directx, blah blah blah. properly. And the graphics side is not the only problem I have with Windows 7. It's filled with junk. Junk I'll never use, and junk I don't really care about for just an operating system. M$ is trying to make something that is an end all, be all for everyone. And has lost sight of the true purpose of an operating system... to run apps. Back to XP for me. i had problems copying folders with more than 1 gb of content in them in windows 7. it worked the first time i tried to copy 150 gb worth of files and was faster than xp. but latter tries always stopped at random percents or would not start at all. i tried from all 4 hard disks in my computer. same result on everyone of them. so i switched back to windows xp. Have two computers. Keep XP on one of them for programs that need XP. Put Linux Mint on the other (newer) machine. You can even put XP in virtual box (free) on the newer machine. Then you have the best of both worlds. I don't need Windows 7. I HATE WINDOWS 7 - IT IS A LOAD OF HYPE AS FAR AS I AM CONCERNED. AS INDIVIDUALS WE ARE ENTITLED TO USE SOMETHING WE ARE FAMILIAR WITH - ESPECIALLY AS WE ALREADY PROGRESS WITH WINDOWS XP VERY WELL. WE ALL HAVE A RIGHT TO CHOOSE WHAT SUITS US.